Peter Horne wants Scotland's backs to play with freedom against Italy and not be shackled by the pressure of ending a nine-match Six Nations losing streak. Scotland's last victory in the tournament came in Rome in 2014. "If you put so much pressure on yourself to get a result, instead of trying to win the game, you can go to trying not to lose," said the 26-year-old Glasgow Warriors centre. "If that happens, everyone goes into their shell and you can't have that." Following defeats to England and Wales, Scotland return to the Stadio Olimpico, where Duncan Weir kicked a last-minute drop-goal for a 21-20 success two years ago. And Horne, who is returning to the squad after a foot injury ruled him out of the competition's opening fortnight, believes the visitors must take a positive approach to get the best out of their attacking threats. "We're here for a reason," said Horne. "We've got some of the most exciting outside backs in the world and a fantastic group of players. 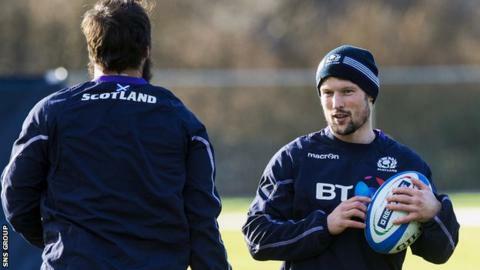 "What good is it if the likes of [full-back] Stuart Hogg and the others are getting worried about making mistakes? "That's not going to help anyone. We need them to be expressing themselves. "Any time Hoggy gets the ball in a bit of space, I light up because I think something is going to happen. That's what we want. We want it to spread through the rest of the squad." A muddled display against England was improved on in Cardiff but several Scotland squad members are still waiting for their first taste of Six Nations victory. "There's no-one hurting more than the players," added Horne, who has been capped 15 times. "We're desperate to set the record straight and get that win. We're all gutted at how things have gone. "We're trying to remain positive. We didn't play well against England but we did against Wales. There were some brilliant moments in Cardiff. "What you can't forget, though, is that at this level, the differences between sides are so small. The games are decided on a few instances. The England game showed that. They had two chances and took them to win the game. We had a couple, didn't take them and lost. "But we're still going in the right direction. It's easy to be negative but that won't get us anywhere. "There are still three games left. We could win all three and people might see it as a successful Six Nations." After a strong showing against France, Italy lost 40-9 at home to England but Horne thinks the scoreline did not tell the full story. "We will need to be at our absolute best to win," he warned. "They should have beaten France in Paris. "They played some great rugby against England until an interception try knocked the wind out of their sails. The score certainly did not reflect the game. "It will be tough but we should be excited about going over there and getting tore into them. "We're looking for a great result and that would kick us on for the games against Ireland and France."